"There's a natural mystic blowing through the air..."
Bob Marley died of cancer in May of 1981, at the age of 36. A legend and an icon in his native Jamaica, Marley had come to symbolize the entire reggae sound to the rest of the world, especially after his landmark Rastaman Vibration release in the mid-1970s. At that time I was about fifteen, and was turned onto the Rastaman Vibration album. The music came as a real cultural flip-flop to me, compared to what most of my friends were listening to at the time (Led Zeppelin, Foghat, etc). When Marley played in Chicago, on what we didn't realize would be his last area concert, I missed out on tickets. I told myself I would catch him next time. Obviously, that would never happen. Luckily for me, Stefan Paul has put together Bob Marley Live In Concert, a disc that captures never before seen concert footage from a 1979 Reggae Sunsplash appearance, and an incredible 1980 show in Dortmund, Germany. Through the course of fifteen songs, Marley and his large band breeze a strong representation of his deep catalog, and the set includes some of his bigger hits, like I Shot The Sheriff, One Love and the always moving Redemption Song. Midway through, Paul includes footage from Marley's 1981 funeral in Jamaica, an event that appears to have had the same impact as the death of a major political leader would have had. Marley sang about love and freedom. 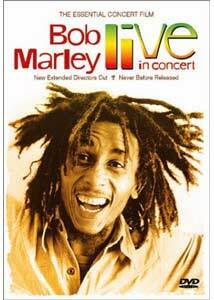 His death was a creative loss to the world of music, but this Stefan Paul concert disc is a good video account of Marley's final tour. Image Transfer Review: Presented in a 1.33:1 full-frame image, this concert disc consists of a number of different pieces of source material, and the quality varies greatly. The majority is made up of Marley's 1980 Dortmund, Germany concert, and the image quality is very good. The 16mm and 35mm footage was transferred into Digi-Beta, which dramatically boosted the richness of the colors. There is minimal grain, and the deep blues of the concert lighting are reproduced well, with no major color bloom. The Montego Bay footage is very grainy, and the colors are slightly washed out. Likewise, Marley's funeral footage is rather grainy, too. This disc is more of a historical document than anything else, and the noticeable variance in image quality is minor. Audio Transfer Review: Docurama has included two audio options for this release: Dolby Digital 5.1 and 2.0 stereo. Only use the 2.0 stereo option if you absolutely have to, because it is regrettably flat and lifeless. The 5.1 track is dramatically fuller, and provides substantially more depth to Marley's music, though there are moments where the high ends turn a little muddy. The surviving Reggae Sunsplash concert footage from 1979 has the weakest sound quality on the disc, with a noticeable amount of crackle. The German concert from 1980, which makes up the bulk of this disc, is a major improvement. The rear channels are used sparingly. Extras Review: Roger Steffen, co-author of Bob Marley: Spirit Dancer, provides three pages of detailed notes on the reggae icon in the disc's insert booklet. The information is not just a quick Marley primer, but it also compliments the disc's concert footage by supplying some additional background on the Stefan Paul's attempts to get the film made. The fifteen songs feature optional English subtitles, which is a nice touch. A brief Marley bio and full discography is also included. A set of Docurama trailers and promotional blurbs fills out the remainder of the extras.